You are here: Home / Bargains / Hot Hallmark Deals! Hallmark $5 off $10 Purchase Coupon + Sales + Rewards! Hot Hallmark Deals! 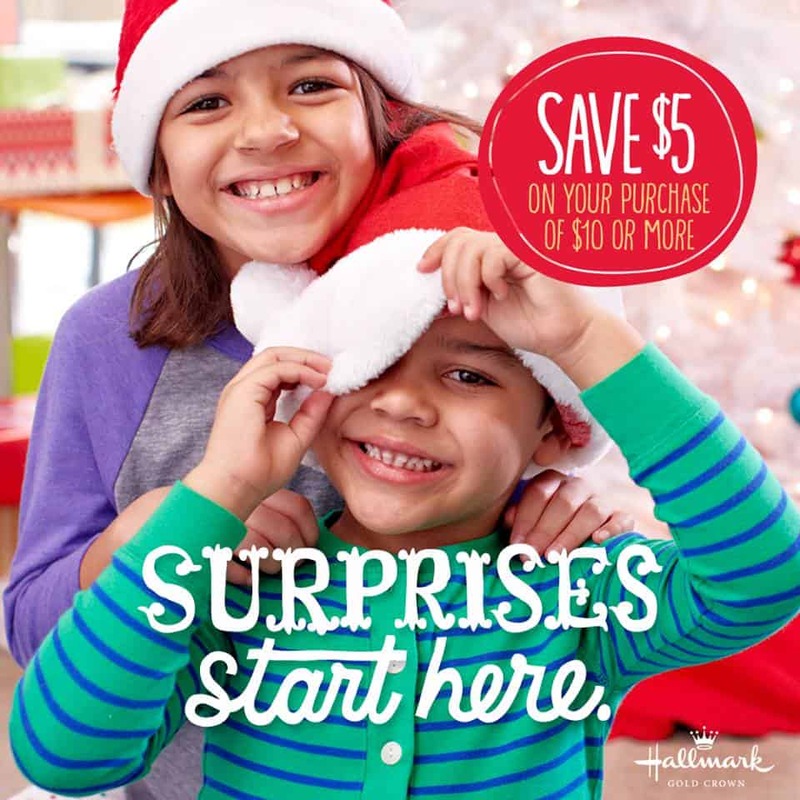 Hallmark $5 off $10 Purchase Coupon + Sales + Rewards! It isn’t too late to run to the Hallmark Store and score some great deals! I actually highly recommend it! Hurry an grab this $5 off $10 Coupon TODAY! I just recently shared with you their NEW Rewards Program that you can use in addition to their Crown Rewards program. Right now they have some awesome sales that you can pair up with some REALLY good Holiday deals and sales! I found some really good sales on their Hallmark Digital Magazine! Check them out after you print off this HOT $5 OFF Hallmark Coupon! Use these on your last minute gifts, stocking stuffers, and more! I have purchased gifts for everyone from our local Hallmark store in the past! They have awesome personalized gifts, toys, and MORE! Blink-a-Long Musical Scarf–> Perfect Gift for the person who has everything and LOVES the Holidays! ONLY $14.95 WYB 3 Cards (regularly $24.95)! (ALSO Save on the Cards you BUY by using the new Cards Rewards (there is another $3 off $3 coupon + each 5 cards you buy earn you a FREE $5 Gift Card)! Have you been thinking about getting an Elf on the Shelf? IF so use this coupon and get him for $5 off!–> These never go on sale so getting $5 off is a GREAT deal! $15.95 with each purchase of three Hallmark cards (regularly $29.95)! ONLY $12.97 for 6 ROLLS of paper! THAT is almost 60% off for PRE-HOLIDAY SALES! Merry Carolers TrioSpecial offer–> Hallmark comes out with new ones every year! We love them and they also make great gifts for the office! HURRY! You only have a few days to PRINT this $5 off $10 Coupon! !